Yeah it’s candy season! I loved watching my children get excited about what they were going to be for Halloween and the family party we planned. I can’t wait to check out the magazines that are published with all sorts of yummy goodies which are to look like scary items. Let’s just say I love the 20 pounds of sugar this month brings :-). 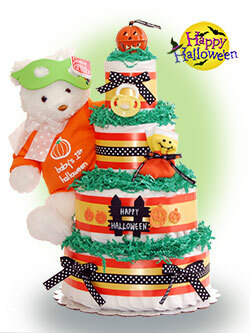 Our Halloween diaper cake of the month is called Our Lil’ Pumpkin Diaper Cake. This design still offers mom and dad Pamper Swaddlers for the new little one – and this new baby is definitely sweeter than sugar. As you can tell, I dressed up Brighton the bear with a Halloween onesie. I say you can always dress up a bear for any ocassion. 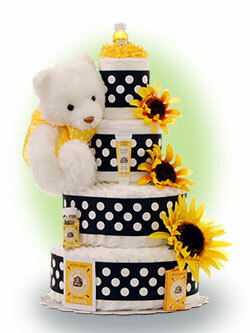 I hope you enjoy the month, enjoy the little kids that dress up, and especially enjoy all the miniature size candy bars you can stuff yourself with……HAPPY HALLOWEEN…..
With summer winding down, I thought it would be nice to create a diaper cake that features a yellow color by using a sunflower as the theme. Obviously, black contrasts very nicely with yellow so I used black ribbon with white dots as the accent. As you probably may know by now, I love Gund bears so I included Brighton on this baby diaper cake. For the baby care necessities I used Burt’s Bees. I hope you enjoy my new design called Sun-Kissed 4 Tier Diaper Cake. For September, it comes with free shipping withing the contiguous US. A savings of $12.95. August has arrived and it’s time for a new diaper cake of the month. 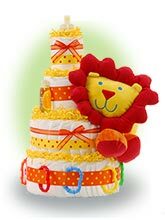 This month, we are featuring the introduction of our Lil’ Lion 4 Tier Diaper Cake. I wanted to create a cake with some vibrant colors for the last month of summer. This cake has bright orange ribbons to complement the plush lion. In addition, since this fits a circus theme, I added some play rings for the new baby. The diaper cake also features our compliment of Johnson and Johnson products. This is a gender neutral cake that would work well for that special newborn. Your comments are always welcome. I hope your summer has been going well. Can’t believe the the start of school is just around the corner for the kids.